Our children grow up so quickly, and once they start growing there’s no stopping them.. As parents, it’s our job to help them get where they’re going safely. 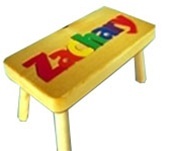 Our personalized step stools for children are designed to help your children learn, grow and explore. 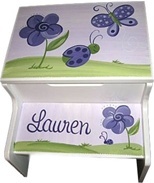 Name stools from Tiny Keepsakes are the perfect way to support them literally and figuratively, giving them their first piece of personal furniture to own and giving them independence in the process. 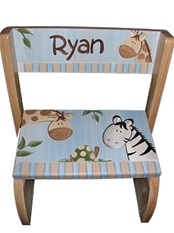 All of our wood stools for kids come in a variety of wood styles and can be personalized with your kid’s name and favorite color, so it will be uniquely theirs. We offer a variety of keepsakes that every child and parent will love together. We have one of the largest selections of step stools for kids including personalized puzzle step stools, storage step stools and two-step stools. At Tiny Keepsakes, we focus on high quality, original products that can be customized based on the needs of our customers. All of our products are crafted with superior workmanship and materials that will last for years. In addition to wood stools for kids, we also offer blankets for babies, piggy banks, kids lunch boxes and other great products that are completely customizable. 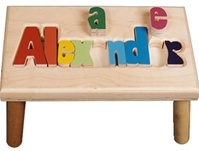 These personalized products are great gifts for children and will be considered thoughtful and useful by parents. In addition to this quality commitment, we have always been passionate about customer service. If you have any questions regarding any of our products, feel free to call us at 888.320.3080 or email us at customerservice@tinykeepsakes.com – we’ll be happy to answer any questions you might have. 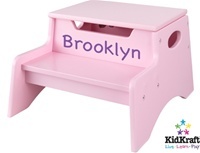 We want to provide you with unmatched quality kid’s step stools and more, for all of our products. That’s why we offer a 5% discount for new customers; with increasing discounts for returning customers through our customer loyalty program. Just type STEP at check out for your 5% discount on your first order; and prepare yourself for many discounts and joyful memories to come.